A firm’s production outputs are what it creates using its resources: goods or services. The profit -maximizing amount of output occurs when the marginal cost of producing another unit equals the marginal revenue received from selling that unit. Output are the quantity of goods or services produced in a given time period, by a firm, industry or country. There are four types of market scenario that a firm may encounter when making a production decision: economic profit, normal profit, loss-minimizing condition, and shutdown. The firm should always produce unless it encounters a shutdown scenario. average total cost: Average cost or unit cost is equal to total cost divided by the number of goods produced (the output quantity, Q). It is also equal to the sum of average variable costs (total variable costs divided by Q) plus average fixed costs (total fixed costs divided by Q). fixed costs: A cost of business which does not vary with output or sales; overheads. Production outputs are the goods and services created in a given time period, by a firm, industry or country. These goods can either be consumed or used for further production. Production outputs can be anything from crops to technological devices to accounting services. Producing these outputs incur costs which must be considered when determining how much of a good should be produced. Determining what to produce and how much to produce can be difficult. Microeconomics assumes that firms and businesses are profit-seeking. This means that above all else they will produce goods and services to the degree that maximizes their profits. In economic theory, the profit-maximizing amount of output in occurs when the marginal cost of producing another unit equals the marginal revenue received from selling that unit. When the product’s marginal costs exceeds marginal revenue, the firm should stop production. Production Conditions: A firm will seek to produce such that its marginal cost (MC) is equal to marginal revenue (MR, which is equal to the price and demand). It is not produced based on average total cost (ATC). Once a firm has established what its profit-maximizing output is, the next step it must consider is whether to produce the good given the current market price. There are several key terms to be familiar with prior to addressing this question. Fixed costs are those expenses that remain constant regardless of the amount of good that is produced. For example, no matter how much of a good you produce, you will still have to pay the same amount of rent for your factory or storage units. Variable costs are only those expenses that are directly tied to the production of more units; fixed costs are not included. Opportunity costs are the cost of an opportunity forgone (and the loss of the benefits that could be received from that opportunity); the cost equals the most valuable forgone alternative. Average total cost is the all expenses incurred to produce the product, including fixed costs and opportunity costs, divided by the number of the units of the good produced. Economic Profit: The firm’s average total cost is less than the price of each additional product at the profit-maximizing output. The economic profit is equal to the quantity output multiplied by the difference between the average total cost and the price. Normal Profit: The average total cost equals the price at the profit-maximizing output. In this case, the economic profit equals zero. In this scenario, the firm should produce of the product. Loss-minimizing condition: The firm’s product price is between the average total cost and the average variable cost. The firm should still continue to produce because additional sales would offset a portion of fixed costs. If the manufacturer stopped production, it would sustain all the fixed costs as a loss. Shutdown: The price is below average variable cost at the profit-maximizing output. Production should be shutdown because every unit produced increases loss. The revenue gained from sales of these products do not offset variable and fixed costs. If it does not produce goods, the firm suffers a loss due to fixed costs, but it does not incur any variable costs. Labor, capital, and land are the three necessary inputs for any production process. Capital, otherwise known as capital assets, are manufactured goods that are used in production of goods or services. Cash is not included in capital in terms of a production input. Homes and personal automobiles are also not included in capital because these items are not directly tied to the production of goods or services. Labor is a measure of the work done by human beings to create a manufactured output. labor: The workers used to manufacture the output. input: Something fed into a process with the intention of it shaping or affecting the outputs of that process. The process of production generates output, otherwise referred to as good and services. Production processes require three inputs: land, capital and labor. Land is simply the place where you produce your product, whether it is a factory or a farm, and may included capital if the output being created is a service. In most scenarios, the inputs in the production process are primarily capital and labor. Capital, otherwise known as capital assets, are manufactured goods that are used in production of goods or services. Control of these assets are the primary means of creating wealth. Included in capital is anything that has been manufactured that can be used to enhance a person’s ability to perform economically useful work. For a caveman, a stick or a stone would have been considered capital. For a post-industrial worker, a laptop, computer, and cellphone would be considered capital. 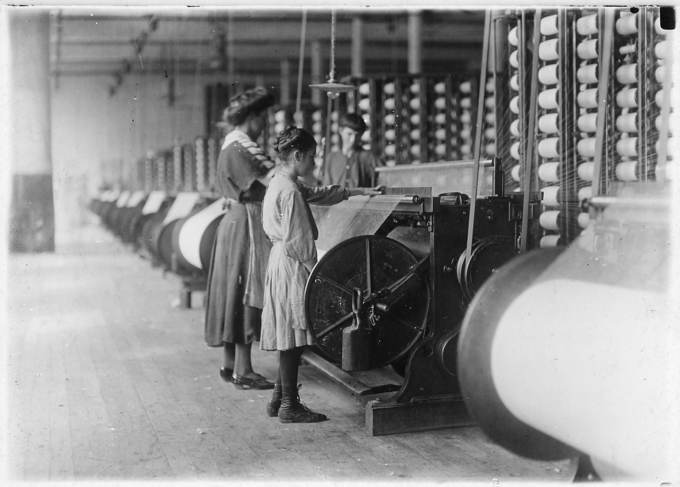 Girls running warping machines in Loray Mill, Gastonia, N.C. by Lewis Hine, 1908.: Any tool or machine that could be used to improve someone’s ability to work would be included in capital. In regards to production, it also is important to know what capital is not. While capital may refer to funds invested in a business in other disciplines such as accounting, cash is not included in capital in terms of a production input in economics. Homes and personal automobiles are also not included in capital because these items are not directly tied to the production of goods or services. Labor is a measure of the work done by human beings to create a manufactured output. Producers demand labor because it aids in producing output which can then be sold. In production, a worker will only be hired when the marginal revenue s/he brings in exceeds or equals the marginal cost of hiring that worker. The cost of one worker is the wage. The value of labor varies based on the skills and talents that the individual worker brings to that job. If the job involves designing and building a computer, an engineer’s labor is more valuable than a tailor. If the job requires the manufacture of a suit, an employer would prefer the tailor. Other elements that influence the perception of the value of a specific type of labor in production include the amount of training necessary to execute the task and the barriers to conducting that type of work. The process of producing and distributing a good or service is called a supply chain, and it is composed of many economic actors. Supply chains vary based on industry, the resources of the manufacturer, and market conditions. The purpose of a supply chain is to act as an integrating function that links major business functions and processes into a cohesive business model. Typical steps in a supply chain include: extraction of raw materials; acquisition of components; production; inventory; transportation; wholesaler; and retailer. supply chain: A system of organizations, people, technology, activities, information and resources involved in moving a product or service from supplier to customer. A supply chain is a system of organizations, people, activities, information and resources involved in moving a product or service from supplier to customer. The company’s supply chain illustrates the total process of transforming raw materials into a finished product, and then selling that finished product to consumers. 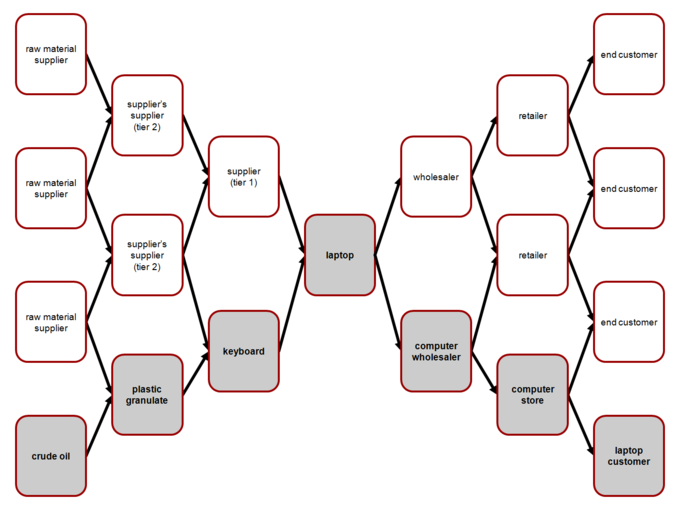 Supply Chain: This represents the typical supply chain for a computer. The right half of the chart represents the steps it takes from producing the final product to the consumers. The purpose of a supply chain is to act as an integrating function that links major business functions and processes into a cohesive business model. When designed well, a supply chain is able to respond to shifts in demand and changes in the marketplace. Based on these shifts, the supply chain is able to alter production levels accordingly so that supply can meet demand so that the firm is able to maximize its profit. Extraction/Acquisition of Raw Materials or Components. Before the production of a good can be initiated, you need to have all of the necessary elements. These elements could be unrefined raw materials that the company transforms into components or pre-assembled parts. A firm may have subsidiaries or divisions that obtain raw materials or it might acquire those elements from a third party. Production. This is the process that transforms the elements acquired from the prior step into the finished good. Economic actors involved in this step include product designers, assembly-line workers, and floor management. Inventory. Once the good is completed, it is generally placed into a centralized inventory location while decisions are made by inventory managers and a firm’s sales division. Transportation. Finished goods must be transported to stores and other locations where consumers can obtain the good. Depending on the type of business, goods may be transferred to smaller regional inventory depots, merchants, or directly to a consumer. Wholesaler. A wholesaler is someone who sells a good to smaller stores, who in turn sells the good to consumers. Retailer. The retailer buys the product in bulk and sells individual or smaller groups of units to the end consumer. The key difference between centrally planned and market economies is the degree of individual autonomy. A pure planned economy has one person or group who controls what is produced; all businesses work together to produce goods and services that are planned and distributed by the government. Planned economies have several advantages. Ideally, there is no unemployment, and needs never go unfulfilled; because the government knows how much food, medicine, and other goods is needed, it can produce enough for all. Realistically, these systems tend to suffer from large inefficiencies and are overall not as successful as other types of economic systems. A pure market economy is one perfectly free of external control. Individuals are left up to themselves to decide what to produce, who to work for, and how to get the things they need. Because there is no regulation ensuring equality and fairness, market economies are burdened with unemployment, and even those with jobs can never be certain that they will make enough to provide for all of their needs. Because they do not need to wait for word from the government before changing their output, companies under market economies can quickly keep up with fluctuations in the economy, tending to be more efficient than regulated markets. Centrally planned economy: When the government is responsible for setting the amount produced. market economy: An economy in which goods and services are exchanged in a free market, as opposed to a state-controlled or socialist economy; a capitalistic economy. While there are many different variations of national economies, the two dominant economic coordination mechanisms are centrally planned and market based. Before you can analyze any national economy, you need to understand these two opposing viewpoints on how to run an economy. The key difference between the two is the amount of individual autonomy within the two systems. A pure planned economy has one person or group who controls what is produced; all businesses work together to produce goods and services that are planned and distributed by the government. These economies are also called command economies because everyone must follow specific guidelines set up by the controlling authority. The reason behind this type of planning is to make sure that everything needed is produced and that everyone’s needs are fulfilled. Since most peoples’ needs are provided for in a centrally planned economy, compensation is primarily morally based. Most assets are owned by the state. Planned economies have several advantages. Ideally, there is no unemployment and needs never go unfulfilled. Because the government knows how much food, medicine, and other goods is needed, it can produce enough for all. But achieving these outcomes depends on the group that organizes production and distribution to accurately identify what the consumers will need, determine what it would take to meet those goals, and anticipate all possible situations. This means there are a lot of opportunities to make a mistake. Realistically, these systems tend to suffer from large inefficiencies and are overall not as successful as other types of economic systems. V.I. Lenin: The Soviet Union, as established by V.I. 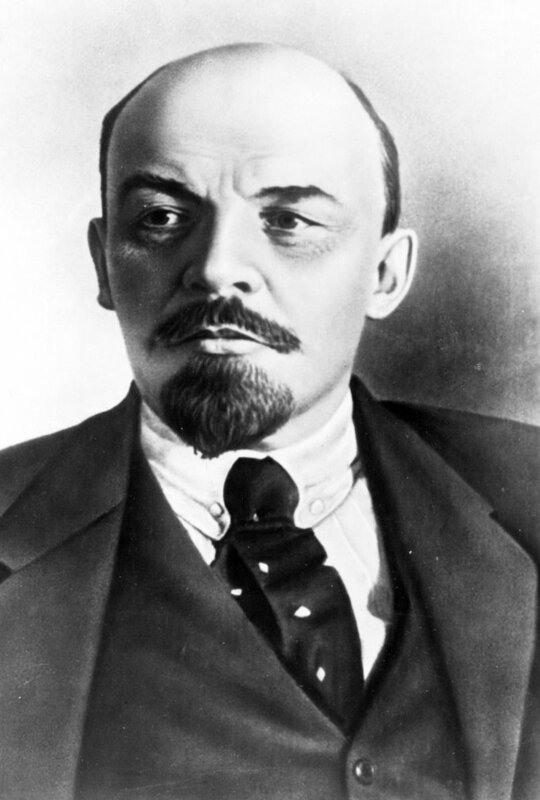 Lenin, is an example of a country that tried to establish a pure centrally planned economy. A pure market economy, or capitalist system, is one perfectly free from external control. Individuals may decide what to produce, who to work for, and how to get the things they need. They are compensated with material goods for their work, and most assets are privately owned. This type of economy, though it may be chaotic at times, allows people to change along with the shifting market conditions to maximize their profits. Although they avoid many of the inadequacies of planned economies, market economies are not free of their own problems and downfalls. Perhaps the greatest problem is that business firms may refuse to produce goods that unprofitable for them. For instance, in 2000 there was a shortage of tetanus vaccine in the United States. Because it was expensive to make, most companies were unwilling to start production themselves, leaving only one firm struggling to keep up with demand. In a planned economy, this shortage would not happen because the government would boost production of the vaccine if it were needed. Because there is no regulation to ensure equality and fairness, market economies may be burdened with unemployment and even those with jobs can never be certain that they will make enough to provide for all of their needs. Despite these and other problems, market economies come with many advantages, chief among which is speed. Because they do not need to wait for word from the government before changing their output, companies under market economies can quickly keep up with fluctuations in the economy, tending to be more efficient than regulated markets. Also, individuals have more freedom and opportunities to do the jobs they want and to profit by them. A mixed economy is a system that embraces elements of centrally planned and free market systems. Most of the means of production in a mixed economy are privately owned in a mixed economy. The government strongly influences the economy through direct intervention in a mixed economy, such as through subsidies and regulation of the markets. Most government intervention in mixed economy is limited to minimizing the negative consequences of economic events, such as unemployment in recessions, to promote social welfare. mixed economy: A system in which both the state and private sector direct the economy, reflecting characteristics of both market economies and planned economies. monopoly: A market where one company is the sole supplier. A mixed economy is a system that embraces elements of centrally planned and free market systems. While there is no single definition of a mixed economy, it generally involves a degree of economic freedom mixed with government regulation of markets. Most modern economies are mixed, including the United States and Cuba. Countries hope that by embracing elements of both systems they can gain the benefits of both while minimizing the systems disadvantages. providing money and other resources segments of its populations, such as through a welfare program. However, the government in mixed economies generally subsidizes public goods, such as roads and libraries, and provide welfare services such as social security. These governments also regulate labor and protect intellectual property.